When you listen to Tyrone Burns, 46, owner of “Pull-up Your Pants Barbershop” on 82nd Avenue and Hillside in East Oakland, you hear the voices of a teacher, counselor, coach, social worker, surrogate parent, minister and small, neighborhood businessman converge into a symphony. For Burns, cutting hair isn’t a job – it’s a vocation. And every day, from behind his barbershop chair, he offers his patrons a message of hope, inspiration and challenge. 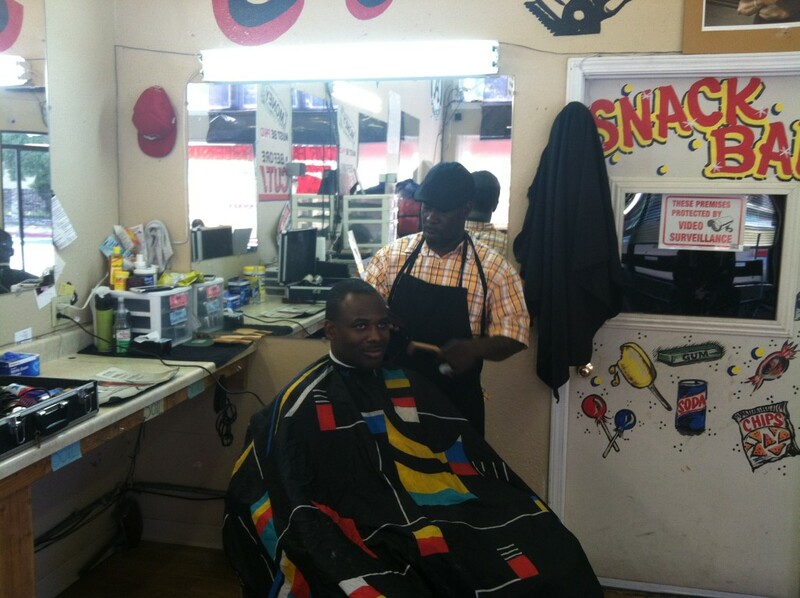 The Jackson, Mississippi native credits two incidents from his youth for inspiring him to become a barber. The first was the shame he experienced when he was teased about qualifying for a school lunch program as a young boy. Humiliated, he began finding small jobs where he earned enough to pay for his own meals. The second happened when he was a teenager and his mother brought home a barber’s clipper so that he and his brother could cut their own hair. Burns moved to the Bay Area in the 1990’s where he found work as an apprentice barber, eventually working at a shop next to a corner grocery store. After store hours, neighborhood residents gathered outside to drink and use drugs. Burns decided to turn the corner of 82nd Avenue and Hillside into something different. He discovered that the commercial space was available. However he had so little money that he could not qualify for a loan. He negotiated with the owner of the building who agreed to a down payment. Burns worked night jobs until he was finally able to make the payment. He opened the shop in 2003. His vision was of more than a small business. The walls of the shop speak to his idea. 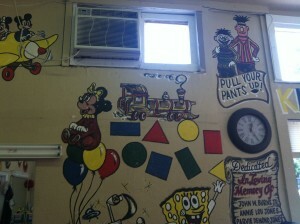 While one wall is lined with logos of local professional sports teams, the others are decorated with colorful cartoon images, including Mickey and Minnie Mouse, Bert and Ernie and Spongepants Bob. He also operates a small snack bar for the children whose parents bring them in for haircuts. Beneath the image of Bert and Ernie looms the ubiquitous message of challenge and dignity – – “Pull up your pants”! Initially, he kept a small sign inscribed with this message in his shop. But it occurred to him that this message could help many children, teenagers and young adults in the surrounding neighborhood. Three years ago he installed large plate glass windows in front of the store. 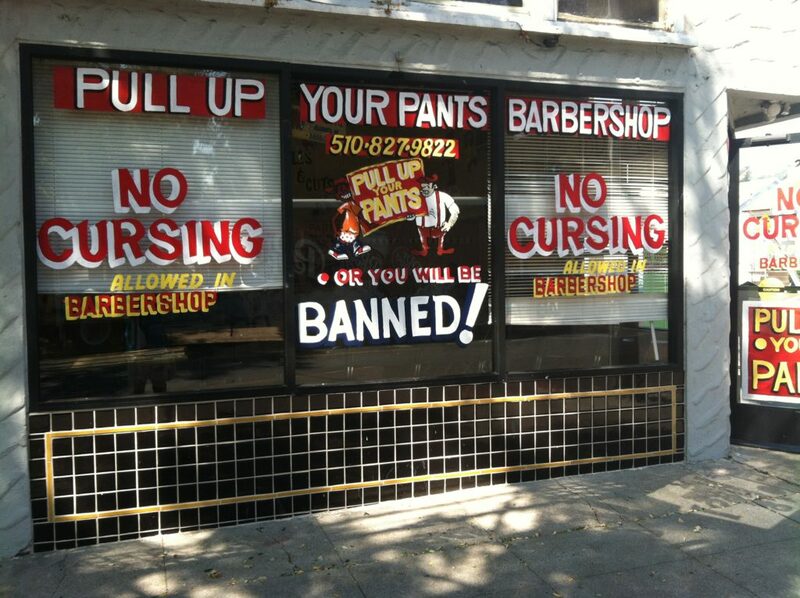 Painted in large, white capital letters on a red background, he inscribed “PULL UP YOUR PANTS BARBERSHOP”. When youth or young adults come into Burns’ shop with pants riding down their backsides, he immediately challenges them to “pull up your pants”! He believes that through that simple act, they will gradually discover a new sense of self-respect and value. ”Some of these young guys walk by the shop with sagging pants, they look in the window and immediately pull up their pants,” he said. A “no cursing” sign also hangs prominently from the shop ceiling. “I want to create a family environment,” he said. For Burns, his patrons and neighbors are more than customers; they have become friends and confidants. From his own background, he understands the financial challenges faced by many in the neighborhood. Periodically, he goes to a church or nearby school and offers free haircuts. Children and high school students know that if they earn a 2.8 grade point average., their neighborhood barber will give them $25 in cash when they show him their report cards. Grocery drivers with extra bread or produce drop it by the store and Burns distributes it to anyone who needs food. At Thanksgiving and Christmas, with the help of his mother ,he provides free meals to those in need of holiday cheer. Schegrun Clos, a regular customer who lives across the street from the barber shop, described Burns as a “blessing to the community”. “He educates and models a positive influence which many young people need,” Clos said. He credits Burns’ community spirit as one reason for a decrease in crime and drug use around the neighborhood.